Please select the right Mode " Adapter or Converter Mode" according to the voltage of the appliance and the adopting voltage of countries. 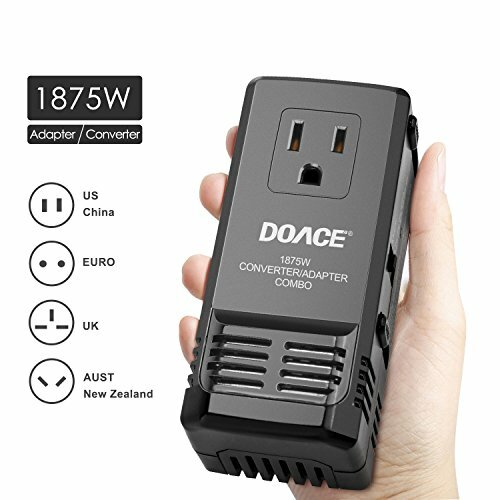 1, Converter Mode can only be used in the countries adopting voltage 220-240V and your appliances' power rating should be 100-120V. 2, Converter Mode can set down voltage set down 220-240v to 100-120V, can't boost the voltage to higher level. 3, The Converter can not be used with low-wattage appliances (0-25W). 4, Converter Mode can only be used with Mechanical Controlled devices that have a power rating from 26~2000 watts. Do not use converter with electronic-controlled devices. Electronic Controlled devices are controlled by SMART CHIP, have auto -on/off ,timer, Touch Screen or pulse function, Such as curling iron, flat iron, Hair straightener..
Dual Voltage Electronic Digital appliance (110-220v, 110-240v) should be used with Adapter Mode. Examples are Phone, Macbook, Laptop, Battery Charger etc. Adapter Mode means wired are connected directly, just power interface adapter style convert. DON'T put your 110v device to 220v input in this mode.